The latest in the Did You Know? series is Frogs Play Cellos, and it’s all about music and instruments. 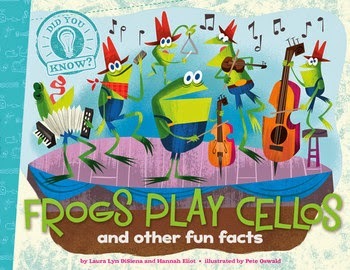 In Frogs Play Cellos, you’ll learn other fun facts about the parts and origins of certain instruments and types of music, as well as cultural influences and musicians. This series of books isn’t necessarily the kind to use for a school project, but it is likely to pique the interest of curious kids and keep them entertained. Jump on in and test your knowledge!